Irinotecan, sold under the brand name Camptosar among others, is a medication used to treat colon cancer, and small cell lung cancer. For colon cancer it is used either alone or with fluorouracil. For small cell lung cancer it is used with cisplatin. It is given by slow injection into a vein. Common side effects include diarrhea, vomiting, bone marrow suppression, hair loss, shortness of breath, and fever. Other severe side effects include blood clots, colon inflammation, and allergic reactions. Those with two copies of the UGT1A1*28 gene variant are at higher risk for side effects. Use during pregnancy can result in harm to the baby. Irinotecan is in topoisomerase inhibitor family of medication. It works by blocking topoisomerase 1 which results in DNA damage and cell death. Irinotecan was approved for medical use in the United States in 1996. It is on the World Health Organization's List of Essential Medicines, the most effective and safe medicines needed in a health system. In the United Kingdom it is available as a generic medication and costs the NHS about 114.00 pounds per 100 mg. It is made from the natural compound camptothecin which is found in the Chinese ornamental tree Camptotheca acuminata. Its main use is in colon cancer, in particular, in combination with other chemotherapy agents. This includes the regimen FOLFIRI, which consists of infusional 5-fluorouracil, leucovorin, and irinotecan. The regimen XELIRI consists of capecitabine and irinotecan. It may also be used together with fluorouracil and folinic acid for pancreatic cancer following failure of initial treatment. The most significant adverse effects of irinotecan are severe diarrhea and extreme suppression of the immune system. Irinotecan-associated diarrhea is severe and clinically significant, sometimes leading to severe dehydration requiring hospitalization or intensive care unit admission. This side-effect is managed with the aggressive use of antidiarrheals such as loperamide or co-phenotrope with the first loose bowel movement. The immune system is adversely impacted by irinotecan. This is reflected in dramatically lowered white blood cell counts in the blood, in particular the neutrophils. The patient may experience a period of neutropenia (a clinically significant decrease of neutrophils in the blood) while the bone marrow increases white cell production to compensate. Camptothecin, one of the four major structural classifications of plant-derived anti-cancerous compounds, is a cytotoxic alkaloid which consists of a pentacyclic ring structure containing a pyrrole (3, 4 β) quinoline moiety, an S-configured lactone form, and a carboxylate form. Irinotecan is activated by hydrolysis to SN-38, an inhibitor of topoisomerase I. 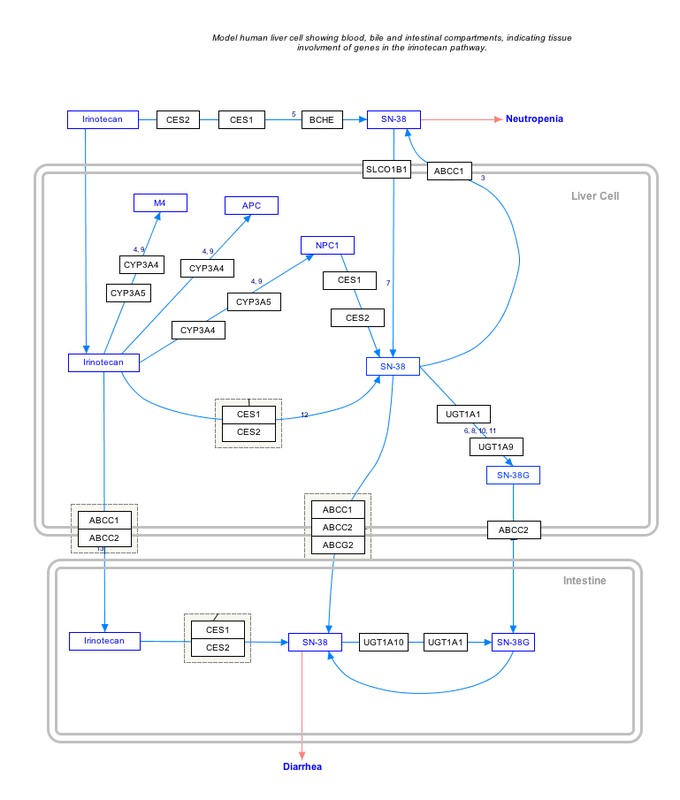 This is then inactivated by glucuronidation by uridine diphosphate glucuronosyltransferase 1A1 (UGT1A1). The inhibition of topoisomerase I by the active metabolite SN-38 eventually leads to inhibition of both DNA replication and transcription. The molecular action of irinotecan occurs by trapping a subset of topoisomerase-1-DNA cleavage complexes, those with a guanine +1 in the DNA sequence. One irinotecan molecule stacks against the base pairs flanking the topoisomerase-induced cleavage site and poisons (inactivates) the topoisomerase 1 enzyme. Irinotecan is converted by an enzyme into its active metabolite SN-38, which is in turn inactivated by the enzyme UGT1A1 by glucuronidation. People with variants of the UGT1A1 called TA7, also known as the "*28 variant", express fewer UGT1A1 enzymes in their liver and often have Gilbert's syndrome. During chemotherapy, they effectively receive a larger than expected dose because their bodies are not able to clear irinotecan as fast as others. In studies this corresponds to higher incidences of severe neutropenia and diarrhea. In 2004, a clinical study was performed that both validated prospectively the association of the *28 variant with greater toxicity and the ability of genetic testing in predicting that toxicity before chemotherapy administration. In 2005, the FDA made changes to the labeling of irinotecan to add pharmacogenomics recommendations, such that irinotecan recipients with a homozygous (both of the two gene copies) polymorphism in UGT1A1 gene, to be specific, the *28 variant, should be considered for reduced drug doses. 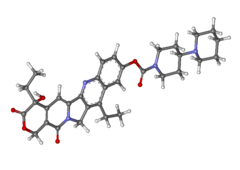 Irinotecan is one of the first widely used chemotherapy agents that is dosed according to the recipient's genotype. Irinotecan received accelerated approval from the U.S. Food and Drug Administration (FDA) in 1996 and full approval in 1998. During development, it was known as CPT-11. A liposome encapsulated version of irinotecan sold as Onivyde, was approved by FDA in October 2015 to treat metastatic pancreatic cancer. It gained EU approval in October 2016. ^ a b c d e f g h i j k "Irinotecan Hydrochloride". The American Society of Health-System Pharmacists. Archived from the original on 22 December 2016. Retrieved 8 December 2016. ^ a b British national formulary : BNF 69 (69 ed.). British Medical Association. 2015. p. 624. ISBN 9780857111562. ^ Heinrich, Michael; Barnes, Joanne; Gibbons, Simon; Williamson, Elizabeth M. (2012). Fundamentals of Pharmacognosy and Phytotherapy. Elsevier Health Sciences. p. 130. ISBN 0702052310. ^ Guo, Y; Shi, M; Shen, X; Yang, C; Yang, L; Zhang, J (2014). "Capecitabine plus irinotecan versus 5-FU/leucovorin plus irinotecan in the treatment of colorectal cancer: a meta-analysis". Clinical Colorectal Cancer. 13 (2): 110–8. doi:10.1016/j.clcc.2013.12.004. PMID 24461997. ^ Kotaka, M; Xu, R; Muro, K; Park, Y. S.; Morita, S; Iwasa, S; Uetake, H; Nishina, T; Nozawa, H; Matsumoto, H; Yamazaki, K; Han, S. W.; Wang, W; Ahn, J. B.; Deng, Y; Cho, S. H.; Ba, Y; Lee, K. W.; Zhang, T; Satoh, T; Buyse, M. E.; Ryoo, B. Y.; Shen, L; Sakamoto, J; Kim, T. W. (2016). "Study protocol of the Asian XELIRI ProjecT (AXEPT): a multinational, randomized, non-inferiority, phase III trial of second-line chemotherapy for metastatic colorectal cancer, comparing the efficacy and safety of XELIRI with or without bevacizumab versus FOLFIRI with or without bevacizumab". Chinese Journal of Cancer. 35 (1): 102. doi:10.1186/s40880-016-0166-3. PMC 5178089. PMID 28007025. ^ "Onivyde (irinotecan liposome injection), for intravenous use Initial U.S. Approval: 1996" (PDF). FDA. 2015. Retrieved 13 February 2018. ^ a b "Onivyde: EPAR – Product Information" (PDF). European Medicines Agency. 25 October 2016. Archived (PDF) from the original on 16 January 2017. ^ "Nirmala, M. Joyce, A. Samundeeswari, and P. Deepa Sankar. 2011. "Natural Plant Resources in Anti-Cancer Therapy-A Review." Research in Plant Biology 1 (3): 1-14". ^ a b Pommier Y (2013). "Drugging topoisomerases: lessons and challenges". ACS Chem. Biol. 8 (1): 82–95. doi:10.1021/cb300648v. PMC 3549721. PMID 23259582. ^ a b Innocenti F, Undevia SD, Iyer L, et al. (April 2004). "Genetic variants in the UDP-glucuronosyltransferase 1A1 gene predict the risk of severe neutropenia of irinotecan". J. Clin. Oncol. 22 (8): 1382–8. doi:10.1200/JCO.2004.07.173. PMID 15007088. ^ "Camptosar – irinotecan hydrochloride injection". April 2016. Archived from the original on 2011-11-18. ^ O'Dwyer PJ, Catalano RB (October 2006). "Uridine diphosphate glucuronosyltransferase (UGT) 1A1 and irinotecan: practical pharmacogenomics arrives in cancer therapy". J. Clin. Oncol. 24 (28): 4534–8. doi:10.1200/JCO.2006.07.3031. PMID 17008691. ^ News Release (22 October 2015). "FDA approves new treatment for advanced pancreatic cancer". FDA. Archived from the original on 24 October 2015. This page was last edited on 25 March 2019, at 21:12 (UTC).